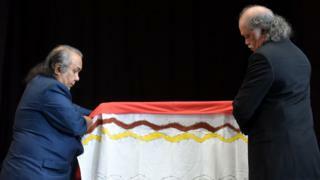 Germany is returning the remains of dozens of Aboriginal ancestors to Australia in what has been called the largest handover of its kind. In total, the remains of 53 ancestors are being returned this month. Skulls and bones of Aboriginal Australians were removed by researchers in the late 19th and early 20th centuries and put on show in museums around the world. Germany has committed to returning the human remains in its collections. Australia's Minister for Communications and the Arts Mitch Fifield welcomed the repatriations, which he said "contributes to healing and reconciliation". He said his government was committed to seeing the "unconditional return of ancestral remains held in overseas collections". The remains of 37 indigenous ancestors from the State Ethnographic Collections and five ancestors from Martin Luther University are being returned on Monday afternoon. Representatives of the Yawuru indigenous group from Western Australia will collect seven sets of remains from the State Ethnographic Collections. The other sets will be put into the temporary care of the Australian government. The return will mark the end of what Australia has called the "largest" repatriation of its indigenous ancestors from Germany. The skeletal remains of an Aboriginal ancestral king were handed over last Tuesday to representatives of the Yidinji indigenous group. Days later, eight ancestors' remains were returned to Australia by the University of Freiburg and two from the Linden-Museum. Work is underway to identify their communities of origin. Why were the remains taken? Australia's native Aboriginal population has occupied the country for about 50,000 years. However, they were displaced by settlers two centuries ago and thousands were killed. For more than 150 years, their remains were removed and sent to museums, universities and private collections in Australia and elsewhere. Some were subjected to "race research". Does Germany have other remains? Germany also has large holdings of African human remains. Officials last month agreed to speed up the return of human remains and artwork from Germany's former African colonies, saying they would determine which "were acquired in a way that legally or ethically would no longer be acceptable". The country has previously repatriated remains to Namibia, where it killed tens of thousands of indigenous Herero and Nama people from 1904 to 1908.